(NaturalNews) For at least the last five years, scary signs of Hillary Clinton's plummeting health have continued to emerge. From her bizarre in-speech "blackouts" to her repeated monstrous coughing fits and her seizure-like bobble head behavior, many people have legitimately wondered whether Hillary Clinton is in the midst of a neurological or cognitive collapse. 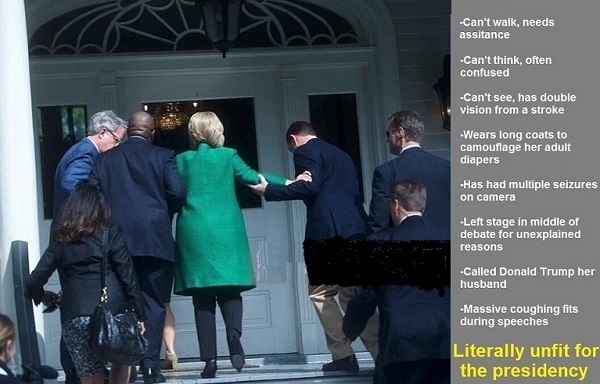 Now, adding to the nationwide concerns about the health of this extraordinary woman who has the remarkable courage to wear a bright green Heaven's Gate cult wardrobe long coat in public, photos have emerged showing Hillary Clinton unable to walk up a flight of stairs without being buttressed by strong-armed men. • Her extreme fear of debating any other political candidate in a live forum, including Bernie Sanders. Every Natural News reader knows by now that the entire mainstream media is nothing but FAKE media pretending to be real. Part of the massive election theater they are carrying out involves desperate efforts to hide Hillary Clinton's bizarre disorders and behaviors from the public. In fact, the entire media is hiding everything about the Clintons, deliberately refusing to ask any real questions about Bill Clinton's rapes and sexual abuse of women, the criminal racketeering operations of the Clinton Family Foundation, nor the ever-increasing number of now-dead people who used to work for the Clintons or the DNC. None of these stories earn a single minute of news coverage from the news networks, all of which are 100% in the pocket of the Clinton criminal cartel. At the same time these news organizations are deliberately hiding the truth about Hillary Clinton's disastrous health collapse, criminal racketeering behavior and sexual predator husband Bill, they are pushing history's most fallacious smear campaign against Donald Trump. Every word he utters is twisted, quoted out of context, lied about or condemned by hypersensitive "faux victims" who hate everything America stands for (and can't the thought of making America great again). That's why we're only finding out about Hillary Clinton's health implosion through the independent, alternative media. 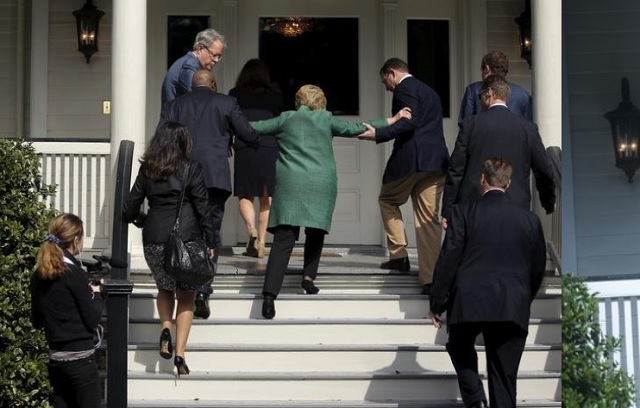 The entire mainstream media won't dare show Hillary Clinton falling up the stairs, having seizures in public or even attempting to debate another candidate in a live forum. Unhinged... shrill... short-circuited... this is the person Obama says is "fit" to be President? 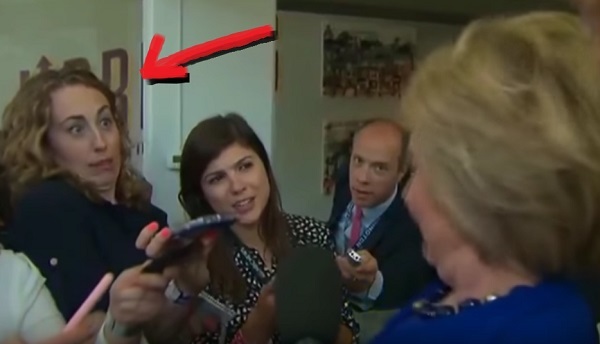 Behind the scenes, Hillary Clinton repeatedly displays irrational hostility and anger escalation, yet the entire rigged DNC and leftist media says that Hillary is intelligent, level-headed, compassionate, honest and ethical. The problem is that nobody believes the media anymore. As more and more truth keeps coming out about Hillary's State Department scandals (looting millions from Haiti disaster victims, selling out the U.S. uranium supply to the Russians, and so on), any real support for Hillary has all but evaporated. It's sad but true: Hillary Clinton is an unlikable, scary and repulsive human being that nobody on the planet enjoys being near. No one likes her. Most of her political support actually comes from people who are terrified of being "suicided" by the Clintons. See this recent death of an attorney and this case of a Sanders supporter found dead after he tried to expose DNC fraud against Bernie Sanders. Setting aside the fringe theories of Hillary Clinton being demonically possessed or a mind controlled biological robot, she dresses like a cult leader and speaks like a medieval dungeon torture maiden. Her most fitting place is not in the White House but rather Helga's House of Horrors where curious, naive tourists might pay five dollars to witness the bizarre neurological freak show that Hillary Clinton has become. And even if Hillary isn't losing her mind, her intact brain is even more frightening due to its criminal, despotic tendencies. If Monsanto's crackpot scientists somehow manage to keep Hillary Clinton's brain alive in a jar full of genetically modified brain cell jelly, her continues cognitive existence would pose such a threat to humanity that we'd have to lock the jar away in a remote cave somewhere just to be sure no future civilization ever discovered it and powered it back on, accidentally unleashing the demons of Hellery. Hillary Clinton is the single greatest argument against immortality technology. Can you imagine the horrific fate of humanity if this anti-human monster were able to live forever? The only real reprieve we all have for the future of the human race is knowing that one day Hillary Clinton's life will pass away just like everybody else's. For even if a powerful political person spends a lifetime lying, murdering, deceiving and destroying, the global elite still haven't figured out how to NOT DIE from old age. And in that realization, we may take comfort and a measure of certainty in knowing that our world will one day be free from the curse of Hillary Clinton and all the pain, suffering, death and destruction she has deliberately carried out against humanity. Until that day comes, we must keep this demented psycho-witch out of the White House and make sure she can't bring harm to anyone else.